Nichole, Alicia and I sold (or not sold) our wares at a craft fair today. 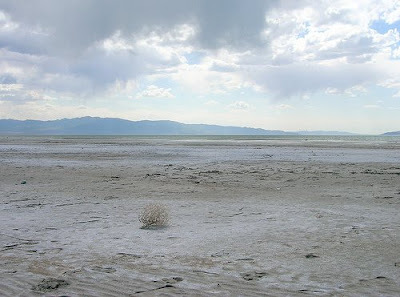 It pretty much looked like this. 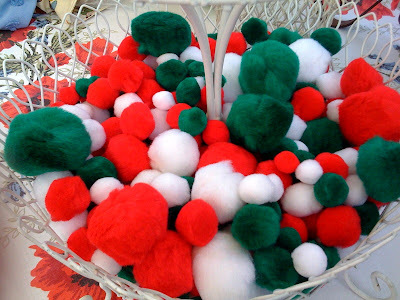 But, while I was there I kept busy with these pom poms. Wander over here to find out. Ditched the ghost town early to get ready for a tri-birthday party celebrating two sweet friends and yours truly. Decided to bring Better Than ... Cake. I got the recipe from a friend who calls it Better Than Brad Pitt. Better Than Not Selling Anything At The Craft Fair Cake. Happy Birthday! Bummer about the craft fair! Darn Economy!! Errrrrrggggg! That has to be the most frustrating thing, and one never knows which craft fairs will be hits, and which will be misses. Hang in there, you've got great items. I saw your signs last night at the tree lighting ... But not you! Hope you had a happy birthday! Ps my girlfriend had a sign in her hand buy didn't want to carry it around all night... Do you still have them avaiiable on etsy? If so I'll send her that way! This sounds really yummy. 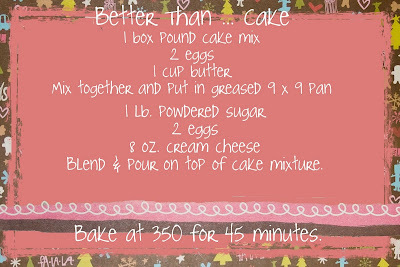 I can't wait to try it I was trying to decide on what to take Saturday night to a party I am going to take your recipe. I will let you know how it turns out. Happy Belated Birthday Julie!